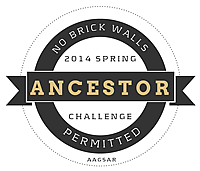 In 2014, I decided to join the 52 Ancestors Challenge started by Amy Johnson Crow. At the time joined late, and was planning to double up some weeks until I caught up. Well, that never happened! So, here I am, the last day of 2017 and I am making my 10th entry. No matter how long it takes, I will make all 52 entries. I wanted to join in to take a closer look at what I have learned about my ancestors so far and get more of their stories out there while I do focused research on a particular line. I am still relatively new to genealogy research and I don’t quite have 52 ancestors on my tree so I will include some collateral relatives that I may be researching. I will link all of them to this page. Happy reading! 4. Finding Henry STOKES –> Shared in the March 17, 2014 The GeneaBloggers Daily (Society section)!!! 7. 103 Years of Life: Samuel Wilson Pruitt (1900 – 2004) –> Shared in the April 15, 2014 The GeneaBloggers Daily (Society Section)!! 9. Nancy CARR PRUITT – Is she really a Creek Indian?